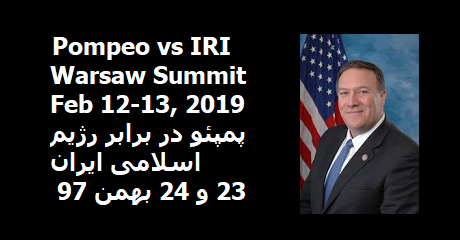 Mr. Mike Pompeo, US Secretary of State has announced that next week Warsaw Summit about the Islamic Republic of Iran (IRI) will be held on Feb 12-13, 2019. Personally I cannot add much to what I have already discussed about this conference during the last two weeks (1). Iranian Secular Democratic Party and Iran's Secular Democratic Movement along with several other political groups have published a communiqué in which they ask to have Iranian political and civil rights opposition groups and themselves to participate in this conference. This coalition and also Prince Reza Pahlavi in their announcements have opposed any military attack on Iran (2); and have asked for US and the International Community to help the opposition of Iran's Islamic regime. Except for Iranian Secular Democratic Party which is an Iranian republican party and has started this action, it is not clear why other Iranian republican secular democratic organizations have not taken any action with regards to this conference and have basically kept silent about it!